Comments on "On the Street.....Fifth Ave., NYC"
i love that that you can't imagine ANYTHING ELSE on this person other than what he's wearing in this photo! the light colors on the top and bottom of this outfit are a well thought-out detail that doesn't look over-the-top or forced. This is one that really repays enlarging for me--the details of the layering underneath the raincoat are terrific (and that hat is a wonderful touch). That 'double pants' thing is soooo cool. His attention to every color and how each makes the rest 'pop' is pure aesthetic perfection. Would have loved to see his outfit without the overcoat. More men should wear hats! i thought it was Mos ... he always looks good! This one made me delurk. The brother is fly! Just so....He has just enough of everything to make his look perfect; according to the "young folks" off the hook. Whoa! Love the coat, and I don't know what's going on with the pants, but with that hat and terrific smile what's not to like? Yeah, baby! I ain't worried about it. I am not really impressed by the outfit.I'm sorry but his jeans looks like he tripped in a puddle of acid. It looks more jumbled together than well thought of. That's art right there. Obviously a very bold, strong personality. It screams him, in an incredibly put together, creative, fashionable way -- which is just what clothes should do. Oh yes Yuzublizzard, I agree. And I'll even go as far as saying that these blogs and us bloggers should be on a very specific mission: BRINGING BACK THE HATS ON MEN! honestly- this is one of the most original people i have seen on this blog in a long while- you really get the sense of this guy-and that he's having a ball and doesn't take himself too seriously- he made me smile. mmmm what about those jeans?! These pants are the perfect defense against those restaurants who have their workers out front scrubbing down the sidewalks with bleach, then you walk by and get little splashy bleach flecks on your cuffs--hate that! Anyway, this photo makes me happy. Thanks. This guy is so casually cool! I look how he looks so laid back and easy going. As the anonymous post above implied, you really do get a sense of his inner personality and not only what's on the inside. frankly, I don't like the pants (at all) but I think this guy looks fantastic. so much style, creativity and verve. then I see the blandly pretty creature just above, who took a look straight off a runway and mashed it up with a couple of other vague trends, and all I think is...yawn. those pants are whack jack! The coat doesn't do it for me, everything is very cool. I love that hat. have those pants been bleached? I would've loved to see the oufit without the coat but I have to admit that I like is dashes of colour. Very interesting layering without looking shabby. 10points! O.K. This is where the man makes the clothes. I like this guy. He seems warm, a "gentle"man. I'm not sure what silhouettes are lurking underneath, but what the heck, he has a genuineness to him that out spirits any clothing hits & misses list. This is definitely a very, well thought out outfit & very together. Love it! Love his smile! His pants look like the car detailing with flames. Hot! 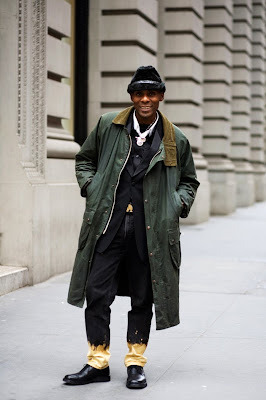 love the coat, the layering, the hat (astrakhan?) but most of all the jeans, which I assume are Issey Miyake? either way- genius! i dont know what is going on with those pants, but it makes me smile. I accept his outfit excluding the jeans, the color of them. Maybe he is a little overdressed too- considering that it is spring. Anon 9:37, sorry to inform you that's definitely not Mos Def. Why is it that all the black men that you portray are dressed so outlandishly? All of the avatars of classic men's style on your blog are white. NYC is full of stylish black men who don't dress like clowns, gigolos, or pimps. Why not show some of us? you seem to have missed photos of Kwesi C. Blair of Robert Burke Assc. or Jeffrey Banks, or Simba in Domenico Vacca or ,most of all, Sartorialist All-Star Mory Kaba. Next time check the archives a little more carefully before you make an uninformed comment like that. Very cool, very stylish. Cheers! How is it possible to wear all that, and yet look so easy peasy? I see this dude around a lot, and each time he has on an interesting get up. He also has a lot of "personality" to go with the mashed up style. Gosh. This is an awesome look. The hat - the coat - the yellow color at the bottom of the pants - and the layers in between...plus the brass belt buckle. Reminds me of a uniform of some kind. I'd join that army. The pants are horrid, but what does it matter?! Look at that face!!! That is one happenin' cat, and it doesn't matter WHAT he has on! At first glance I thought this was an "old man style" entry, but obviously, it definitely is not. The influence there is intriguing, though. I love those slacks (jeans?). So fresh and the whole outfit is unique without being outlandish. Definitely this is one that one needs to click through to the large image to enjoy. I love the 'highlighted ankle' effect that makes the belt pop. Excellent! If he gets rid of the coat, it would be perfect! can anyone tell me what kind of hat that is?